Free Spirit Publishing, 9781575420035, 304pp. Written with help from hundreds of gifted teenagers, this handbook is the ultimate guide to surviving and thriving in a world that doesn’t always value, support, or understand high ability. Full of surprising facts, step-by-step strategies, practical how-tos, and inspiring quotations, featuring insightful essays contributed by gifted teens and adults, the book gives readers the tools they need to understand giftedness, accept it as an asset, and use it to make the most of who they are. 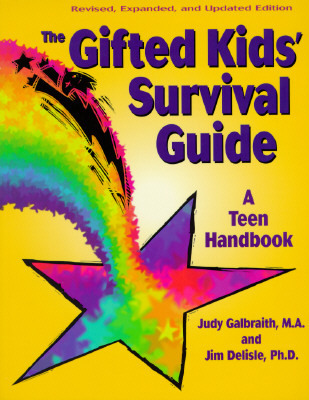 The Gifted Kids’ Survival Guide: A Teen Handbook is a must for gifted teens, their parents, teachers, counselors, and anyone who cares about smart, creative, curious kids. Judy Galbraith, M.A., has a master’s degree in guidance and counseling of the gifted. She has worked with and taught gifted children and teens, their parents, and their teachers for over 20 years. In 1983, she started Free Spirit Publishing, which specializes in Self-Help for Kids® and Self-Help for Teens® books and other learning materials. James R. Delisle, Ph.D., has taught gifted children and those who work on their behalf for more than 30 years. He retired from Kent State University in 2008 after 25 years of service as a professor of special education. Throughout his career, James also worked as a part-time teacher of gifted middle school children. This weekly excursion into the real world of public school classrooms helped to cement both James’ professional credibility and his respect for the hectic lives of classroom teachers. His work’s practical application is a direct result of this weekly intervention into the world of schools. The author of more than 250 articles and 14 books, James' work has been translated into multiple languages, and has appeared in professional journals as well as The New York Times and on The Oprah Winfrey Show. A frequent presenter on gifted children’s intellectual and emotional growth, Jim has addressed audiences in 48 states and numerous nations.